This ornament is a tribute to my very photogenic and talented nieces and nephews who never get tired of posing for the camera – especially during the holidays! 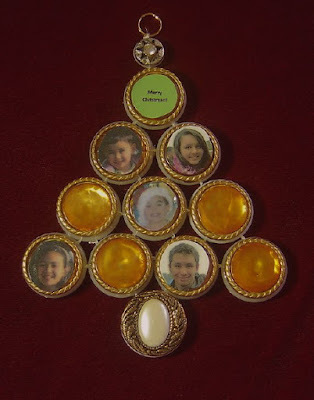 Every Christmas they can expect Aunt Laura to craft something special and this year I created their own family tree from curtain rings and buttons. Cut about 8” of thread. Starting with the small (1/2”) and larger (3/4” or 1") plastic rings, tie a double knot in the larger ring. Pass one end of the thread through smaller ring. Tie a double knot on the small ring. Your rings should look like the figure 1. This is the top ring of the tree with the hanger ring. From this point on, you will be tying 1” rings together. Dab a little clear nail polish on the knots and let dry. Cut excess thread as close as possible to the knot. Use the ¾” or 1” rings to complete the rest of the tree. Cut another 8” length of thread. Tie a double knot in the first ring. Pass one end of the thread through the second ring and tie a double knot in the second ring. Dab a little clear nail polish on all the knots and let dry. Cut excess thread as close as possible to the knot. You should have 2 rings tied together as shown in figure 2. Cut another 8” length of thread. Tie a double knot in the first ring. Pass one end of the thread through the second ring and tie a double knot in the second ring. Cut another 8” length of thread. Tie a double knot in the 2nd ring (directly opposite from the first double knot that is connecting the first ring to the second ring). Pass one end of the thread through the 3rd ring and tie a double-knot in the 3rd ring. Dab a little clear nail polish on all the knots and let dry. Cut excess thread as close as possible to the knot. You should have 3 rings tied together as shown in figure 3. Cut another 8” length of thread. Tie a double knot in the first ring. Pass one end of the thread through the second ring and tie a double knot in the second ring. Cut another 8” length of thread. Tie a double knot in the 2nd ring (directly opposite from the first double knot that is connecting the first ring to the second ring). Pass one end of the thread through the 3rd ring and tie a double knot in the 3rd ring. Cut another 8” length of thread. Tie a double knot in the 3rd ring (directly opposite from the first double knot that is connecting the second and third ring). Pass one end of the thread through the 4th ring. Tie a double knot in the 4th ring. Dab a little clear nail polish on all the knots and let dry. Cut excess thread as close as possible to the knot. You should have 4 rings tied together as shown in figure 4. Cut another 8” of thread. 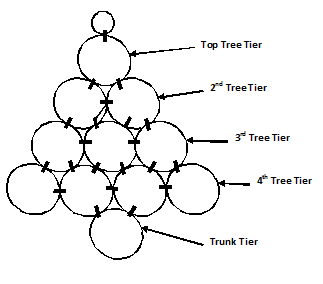 Tie a double knot in the larger ring of the top tree tier. Pass one end of the thread through the first ring of the 2nd Tree Tier and tie another double knot. Cut another 8” of thread. Tie another double knot in the larger ring of the top tree tier. Pass one end of the thread through the 2nd ring of the 2nd Tree Tier and tie another double knot. Cut another 8” of thread. Tie a double knot in the first ring of the 2nd ring tree tier. Pass one end of the thread through the 2nd ring of the 2nd tree tier and die another double knot. Adjust the rings so that they lie flat as shown in figure 5. Continue to tie knots in the required rings through the Trunk Tier using figure 6 as a guide. Dab a little clear nail polish on all the knots and let dry. Cut excess thread as close as possible to the knot. Cut another 8” of thread. Tie a double knot in the small ring at the top of the tree directly opposite the knot that joins the larger ring. Pass the thread through an 8mm jump ring and tie a double knot. Using the paintbrush, brush glue around the top of each ring and place a button on top (glue the smaller button to the small ring for a tree topper). Remove the shanks from the buttons if they prevent the rings from lying flat. Cut small photos of family members (or other pictures) to fit on the tops of the buttons. You can also add small Christmas stickers to the button tops if desired. Use repurposed earrings instead of buttons in the tree or mix earrings with buttons. Copyright © 2010 by Laura Zupko. All rights reserved.